Two stories of two elderly women trying to survive in S'pore. By Andrew Loh. Along Serangoon Road, her fragile frame bends as she reaches into the trash bin. In Little India, the tiny woman with her hunched back draws nothing more than a few nonchalant passing stares. She had earlier emerged from a crowd of pedestrians, clutching two plastic bags, one in each hand, containing unwanted soft drink cans. Perhaps fearing other scavengers like herself in the area, she quickens her steps towards the bin placed by the side of the road. As traffic rushes, she pauses. She lays the two bags on the ground. She peers into the trash and dips her hand into the green-coloured refuse container. As she does so, her face brushes against the top of the soiled bin. She spends quite an amount of time going through the content looking for that one or two precious discard which she could sell for a few cents later. It is a warm afternoon and the nearby shopping malls are filled with foreign workers and shoppers. But no one pays the woman any mind. A man walks up to the bin. He spits into it. He walks away. The woman continues rummaging. She finds nothing. She picks up her bags, looks around for a bit, and limps away, disappearing into the crowd which she had emerged from. Several minutes later, a man, about 50-plus, draws up to the same trash bin. He looks into it, dips his hand as the elderly woman had done earlier, but with more urgency. He finds nothing and hurries off. He would later make a second attempt. I understood the elderly woman’s fear of the presence of other scavengers. 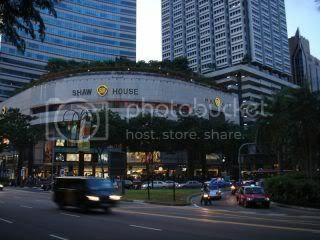 Shaw House (Lido theatre) is a glitzy place, where shoppers and cinema-goers abound, even late in the night. Under the lights of Shaw House in Orchard’s shopping belt, Mdm Tan (not her real name) stands waiting. Her wares are displayed on two plastic bags on the ground. She is hoping to make a few sales from the tin of Milo, several packets of instant noodles, some canned food, a box of salt, packets of tissue papers, among other assorted goods. “I am selling these to help pay for my living expenses,” she says to me in Chinese, referring to the three main items she has to pay for every month – her service and conservancy charges, utilities and the rental for her one-room flat. It all comes to about $50 to $70, she tells me. How much does she make from plying her products on the street, which she tells me she has been doing for the past one year? Mdm Tan doesn’t want to say. “It’s barely enough,” is all she would offer. “I am almost 80,” she says in Teochew, as I noticed the fingers on both her hands. They are deformed from the arthritis which she suffers from, not unlike those in these pictures. (http://en.wikipedia.org/wiki/Arthritis ) “I’ve had this for years now,” she explains. “It’s painful whether there is rain or not,” she says when I asked if the weather made the pain worse. How does she manage to lug two full plastic bags of goods, which include canned food, to Orchard? “Slowly,” she smiles. “I take the bus.” Besides the obvious physical obstacles she has to overcome, she sometimes also has to contend with zealous health inspectors from the National Environment Agency (NEA). Relating several stories of her encounters to me, she was particularly annoyed with one. “Once, this tigu (health inspector) came up to me and warned me, ‘You have five minutes to pack your things and leave this place!’ I showed him my hands and told him, ‘Look at my fingers. How can I pack up in five minutes?’” Another instance saw an NEA officer threaten to confiscate her cans of condensed milk, which she had displayed for sale in the streets, if she didn’t pack up and leave. But by and large, Mdm Tan says most of the officers have been sympathetic towards her. As we spoke, a caucasian man approaches her for a pack of tissues. He pays her $2. A little while later, a young Singaporean girl too wants a pack of tissues. “Buy something from her,” I urge. “She’s just trying to make a living.” She declines but gave Mdm Tan $4 for the single pack. Mdm Tan has never married and thus has no children. She devotes most of her time to visiting the Buddhist temple at Kim Yam Road, which is near her home. “We are all sinners when we come into this world,” her eyes sparkle when she speaks of her religion. “There are precepts we must follow in order to live a good life.” Her one fervent hope is that when her time arrives, she would be able to reunite with “those very nice people at the temple” who have gone before her. It was almost midnight. Rachel suggests we buy her dinner as Mdm Tan has not eaten. I agree. The four of us then proceeded to a coffeeshop near where Mdm Tan lives. As we walk her home to her flat at about 2am, Mdm Tan urges me to attend some of the sessions at the temple. “It’s very good. They also have it in English if you don’t understand Chinese,” she informs me. I told her I may drop in on one of them. In the long corridor of the 14th floor of her block, we finally bade her goodnight, as she closes the door and gets some well-deserved rest. Tomorrow, she repeats her routine. *Special thanks to Rachel Zeng and Chong Kai Xiong. Picture of Shaw House from Wikipedia. 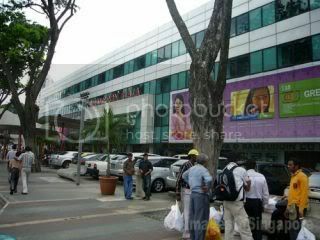 Picture of Serangoon Plaza from Images of Singapore.